Considering I’ve never made pastry before, let alone quiche, this was a Project. But it’s on The List and what’s a long weekend for if not over-ambitious cookery projects? The following recipe includes how to make the pastry. If you buy ready-made, just skip that gubbins and make straight for the quiche bit. This recipe is adpated from Leith’s Cookery Bible. You want the butter and lard to be cold. This is, apparently, the trick to pastry-making. If they’re soft, they’ll be greasy and won’t make nice pastry. My mother-in-law also tells me you’re supposed to have cold hands, so I got a bag of frozen peas out of the freezer and held it in my hands whenever I felt they were getting a bit warm. This may have been a bit extreme. Make sure you’re wearing an apron. Sift the flour and salt into a large bowl and then rub in the cubes of lard and butter wth your fingertips. Try to do this lightly and persevere until the mixture resembles coarse breadcrumbs. Add two tablespoons of water to the mixture. As the recipe specifies “very cold”, I used ice-cubes. Again, this may have been a bit extreme. But it worked, so I’m not complaining. Mix to a firm dough, first with a knife and then with your hands. 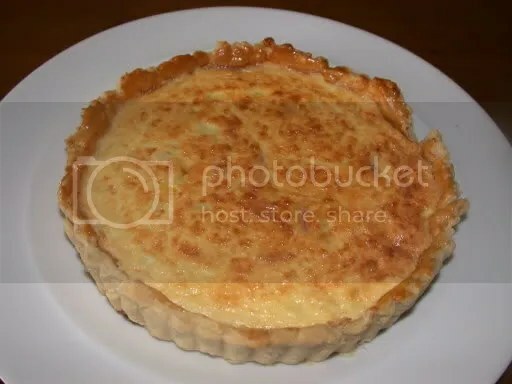 If absolutely necessary, add more water but the pastry should not be too damp – although crumbly pastry is more difficult to handle, it produces a lighter result. I used 2 ice cubes and didn’t need any more. Now comes the tricky bit – rolling it out. With a floured rolling pin, roll the pastry out on a floured surface into a circle big enough to line the quiche dish. Now, shortcrust pastry is tricky and I had to do several attempts before I successfully managed to line the dish – the pastry tears easily. The best way is to roll it out and then roll it round the rolling pin (like a swiss-roll type affair), and use that to lift it over the dish, and then roll it back out onto the dish. Don’t worry if you get little tears, just patch it up with any excess pastry. No one will know. Make sure the pastry is well-fitted into the dish. Now refrigerate it in the fridge for about 30 minutes – this relaxes it and prevents shrinkage when it’s cooked. Pre-heat the oven to 200C/400F. Go and have a cup of tea. Line the raw pastry case with some foil or baking parchment and fill it with dried lentils, beans rice, or even pebbles or coins – this is to prevent the pastry bubbling up during cooking. When the pastry is half-cooked (about 15 minutes), remove the “blind beans” and foil/paper. Brush the pastry with the egg yolk and return to the oven for 5 minutes until it’s turned a nice golden colour. Remove from the oven and set aside. Fry the onion and bacon gently in the butter until cooked but not coloured. Drain well. Mix together the milk, cream and eggs and add the onion, bacon and cheese. Season with salt and pepper, remembering that it’s already quite salty from the cheese and bacon. The mixture will be gloopy. Reduce the oven temperature to 150C/300F and pour the mixture into the prepared flan case. Bake the quiche in the centre of the oven for about 40 minutes. Remove the quiche outer casing and bake for another 5 minutes to allow the pastry to brown. The top of the quiche should be ever so slightly golden. Leave it too cool and set for 15 minutes. Serve straight away or later cold. Marvel at your cookery prowess. LARD! I’m so proud of you making your own pastry. It takes practice, but once you’ve got it down, you’ll wonder why it was so difficult in the first place. Fran that looks delicious. I hope it was as nice as it looks. Its a good idea to rest the pastry in the fridge before you roll it out and line the tin. Hope that this is helpful.